LIVINGHOUSE offers a large selection of the latest designer taps and bath fillers in 25 designer ranges which are all beautifully styled and manufactured in Italy and selected for their stunning looks, great design and most importantly the quality of manufacture. 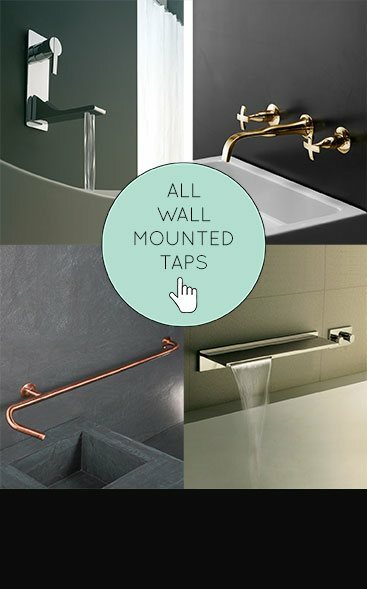 Our contemporary and traditional tap collections can be deck mounted or wall mounted or for floor mounting in the latest freestanding styling we also offer basin and bath wall spouts from our waterfalls taps collections; there are mixer taps for basins, baths and bidets as well as handheld and fixed shower heads. We also have a high quality range of shower valves to match, that can be manual or thermostatically controlled. Only dealing in luxury quality and design led, our taps and fillers are made from solid brass with chrome, gold, polished and brush nickel, stainless steel, black, brass and copper finishes. With gold being very much the latest vogue we offer 4 gold bathroom tap collections in both traditional and contemporary designs. We also offer other finishes including satin black coloured taps which looks superb alongside chrome, brushed stainless steel taps giving a matt alternative to polished chrome, copper plated finish for unique bathroom styling and also nickel and brass taps in brushed and antique finishes for a more traditional bathroom finish. And if you are looking for the very latest tap finishes we have newly added to a range of black chrome and brush black chrome which is a unique and exclusive finish just launched from Italy. If you are looking for the re-invention of the tap, look no further than the exclusive Modular collection. This tap and shower system is completely modular. The pipework of spouts and accessories can run the whole length of the bathing area filling your sink, then the bath with space for towel hanging, a soap dish and toothbrush holder attachments. Very simple but clever. All of our designer taps and bath fillers are European and Italian made and come with good guarantees and conforms to ISO 9001 2000 standards. Many of our luxury taps are stocked and available generally within a few days or if to special order usually within 3 weeks. All our ranges include basin taps for deck and wall mounting, matching bath fillers that can be wall mounted, deck mounted or floor mounted in the latest freestanding styling and to compliment we have matching manual and thermostatic shower valves and adjustable, fixed and waterfall shower heads. Most of our taps are stocked and available generally within a few days. Please view our full range of modern taps. We offer 24 complete collections of the latest tap ranges in chrome, gold, nickel, stainless steel and a brand new collection of copper taps. These contemporary taps are all European manufactured and the best in Italian and German styling. We offer taps for basins, baths & matching shower fittings. Livinghouse supply a traditional & contemporary range of yellow and rose gold plated bathroom taps which are solid brass in construction with a thick gold plating. These luxury taps are the latest in Italian styling and beautiful European quality. Within these ranges we offer Victorian styled taps, contemporary waterfall taps & a lovely classically contemporary range as well. Please note gold finished taps are supplied to special order. Livinghouse offer 4 beautiful collections of nickel taps which are European quality & supplied in contemporary, traditional & waterfall styles in polished & in satin brushed nickel finishes. The full range includes nickel bath & basin taps plus to match nickel shower heads, shower valves & shower fittings. Please note nickel finished taps are to special order, allow 3 to 4 weeks. A stainless steel tap collection of bathroom fittings with a brushed stainless finish. This collection gives an lovely design alternative to chrome. We offer a full stainless steel bathroom fittings collection including basin taps, bath filler taps, fixed & adjustable shower heads aswell as shower valves and thermostatic shower valves & basin bottle traps to match. 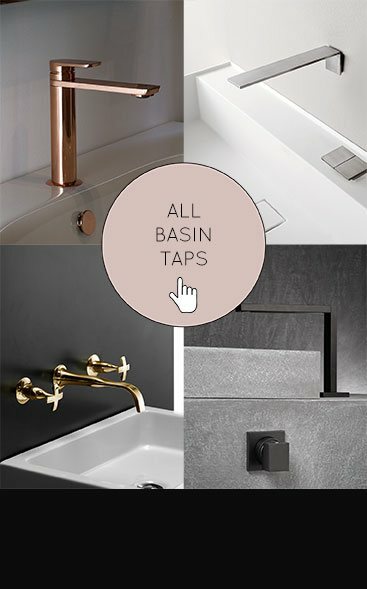 An exclusive range of black taps specially designed for a contemporary bathroom theme. These coloured bathroom tap fittings mix a satin black with a chrome polished finish to great effect. Within this Italian collection we can supply basin taps in wall and deck mounted designs, as well as wall hung black bath taps and freestanding bath fillers, plus to compliment we also have black shower heads and matching shower valves. Livinghouse have added this stylish collection of copper bathroom taps to their modern tap range. Within this brand new contemporary collection we can offer wall mounted and deck mounted copper basin taps, freestanding and wall mounted copper bath taps and fillers as well as matching copper shower heads, manual shower controls and thermostatic shower valves. Livinghouse supply brass taps in satin, matt and antique brass finishes plus a range in natural unfinished brass. Our collections are in traditional & contemporary tap styles & we offer a full range of taps to complete a brass themed bathroom. Included are brass basin taps in wall mounted & deck mounted designs including single lever mixer taps, brass bath taps that are wall & deck mounted with & without handheld shower head attachments plus matching brass shower heads & thermostatic shower valves. 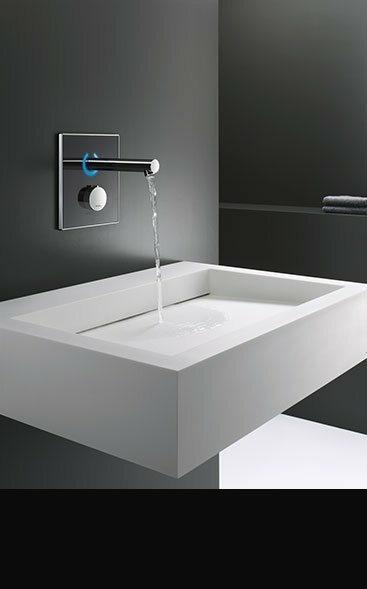 The sensor tap range is an illuminated collection of digital and automatic taps and shower fittings. Included are wall mounted basin and bath taps with glass touch screens which are also illuminated, as well as electronic shower valves, shower columns and electronic toilet cisterns with automatic sensor flushes. Black chrome is a new finish to bathroom tap design & makes a stylish alternative to other more traditional finishes. These black chrome taps are available in polished or brushed finishes. We supply a full range of matching bathroom taps including basin & bath taps in deck mounted & wall mounted designs plus matching shower fittings, including fixed wall & ceiling mounted shower heads, recessed manual & thermostatic shower valves & bathroom accessories. If you are looking for a luxury or designer basin tap in chrome, gold, brushed stainless steel, polished copper, brass, black, nickel, black or black chrome finishes, then Livinghouse offers superb European quality in latest contemporary and traditional styling. Our basin taps are available in single lever, monobloc and mixer designs for both wall mounting & deck mounted installation in single, 2 hole & 3 hole styles. Please view all of our beautiful bath taps & bath filler. 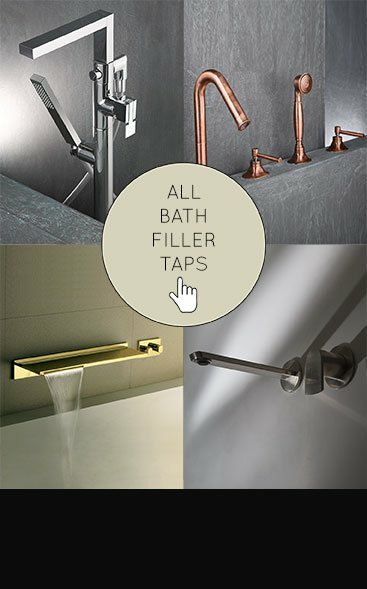 Within this selection we show all the different designer tap styles in the latest luxury, traditional & contemporary styles. 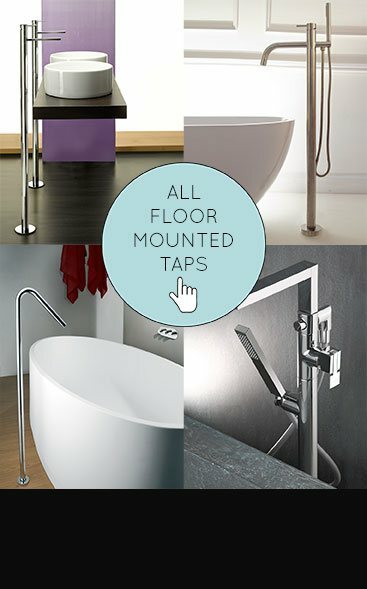 Our exclusive taps are available as wall mounted and deck mounted bath taps as well as freestanding tap designs. We also offer the finishes chrome, gold, nickel, stainless steel, brass & copper. 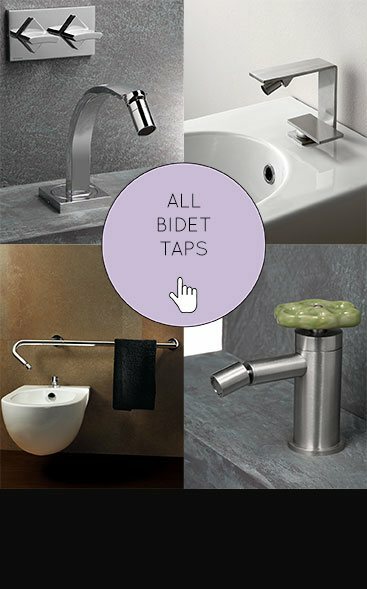 Superb luxury range of stylish bidet taps in chrome and brushed stainless steel that are Italian designed and manufactured in latest contemporary and unique styles. Our bidet taps can be on the bidet mounted or in the more modern wall mounted style. Wall mounted taps is becoming the vogue especially with the rise in popularity of wall hung bathrooms in contemporary design. 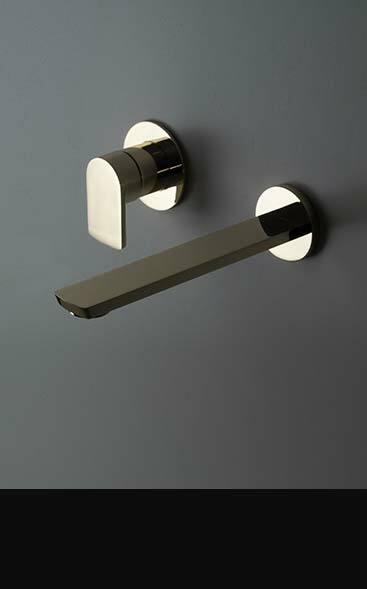 At Livinghouse we can supply wall mounted bathroom taps, including wall mounted basin and bath taps. We offer luxury quality designer taps in chrome, gold, brushed stainless steel, copper, brass, nickel & black finishes, as well as automatic sensor range. 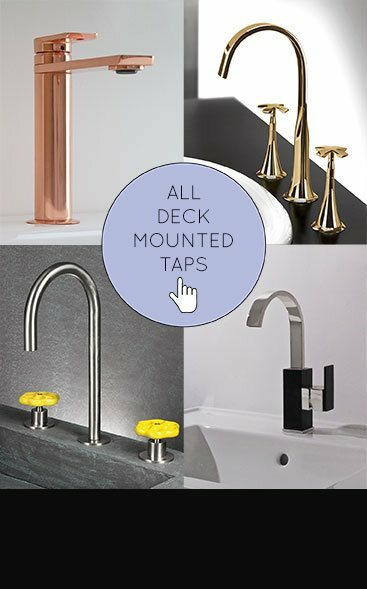 A lovely range of deck mounted taps suitable for basin, countertop and bath rim mounting & available in the finishes of chrome, gold, brushed stainless steel, copper, brass, nickel & black. We offer our designer basin & bath taps in many traditional & contemporary styles & are luxury European quality. We also offer illuminated & automatic sensor taps in the latest modern designs. A stunning designer led luxury bathroom needs a stunning focal point & our lovely collection of freestanding bath taps & floor standing basin fillers makes that stylish design feature. Our freestanding taps are supplied in chrome, gold, brushed stainless steel, copper, brass, nickel & black in traditional & contemporary designs.